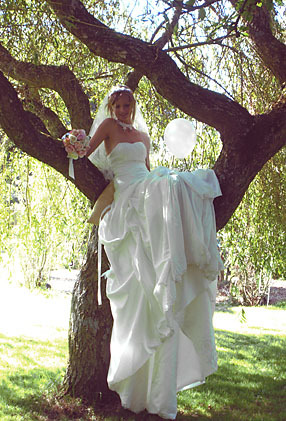 EVERY bride should look beautiful on her wedding day. I offer a personal and attentive service combining warmth, enthusiasm and professionalism. Most important, I LISTEN. Your first 1 1/2 hours are free, after which I charge £40 per hour, which will be deducted from the price of the dress you choose. Should you not find a dress, any charges are payable before you leave, by either cash or check. Usually we will have an initial chat by telephone to establish your size and what you have in mind (if anything) in order that when you visit your experience will be pleasant and stress free. Once you do decide on a dress I ask for a non-returnable 30% deposit, with the balance payable within 6 weeks. 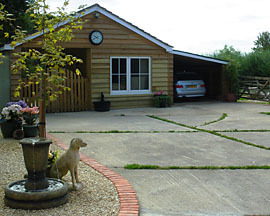 • Situated in the tiny hamlet of Kings Stag near Sherborne with ample on site parking … so no hiking from the multi-storey fighting through crowds! Opposite village pub so 'have a think with a drink' when you've narrowed down your choice …. • I have spent many years building up reliable suppliers and contacts. My stock is sourced from ex-display, sample & photo shoots, plus end of line & bankrupt stock so some may have been tried on/worn for an hour but NOT for a wedding. Gowns may have loose threads, and/or beads and the odd imperfection because of how they are sourced, but most have original labels, tags etc still attached. As a result, I can offer VERY competitive prices. • Because I work by appointment (7 days a week including evenings), you will never compete with 'off the street' customers leaving you feeling rushed or harassed. You will receive relaxed, professional attention without pressure. • Many outlets offer limited designers in limited sizes. My stock includes some 20 designers in a vast variety of styles, with approx. 25 dresses in each size range (6 to 28). The way I source my gowns makes this possible. Should you wish to try all 25 – you shall! No "sponges" here to 'pad you out' – and no 5 month wait! The dress you try is the dress you buy. • It is unusual for NO alterations to be necessary to a wedding gown and I work closely with a very talented local seamstress. 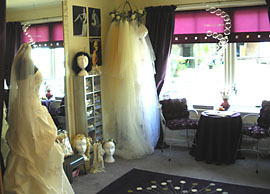 I can also offer advice on other associated wedding services in the area (see links).